Starting in Emerald city you have to retrieve some item for winning the contest, meanwhile I suggest to visit all the shops and learn all the skill you can, especially the magic one,made some training when you get some experience and start try to make the potions . Floor Tile: enter the Temple of the Moon then look for the secret chamber in the library. Longbow: Look for it in Dragon's Lair . Musical Instrument: the woman near the Two Palms Tavern have it . Red Potion: first try for a potion use a empty bottle and a red flower. 100 gold. Another lies in a box inside the abandoned tent(where you'll find a lot of dragonfly). Wealthy Hat: . 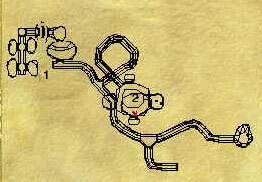 There is one inside the Temple of the Moon or talk with the solder near the dragon cave. 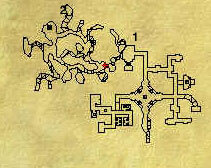 Find The Missing Contestants: look for the shield and the message scroll on the floor of the dragon cave. Talk to the man in the inn,then you'll have to clear the castle from rats and bats,look for the experience barrels,then go to the man in the inn. Dwarves in the red Dwarves mine in the bracada desert. 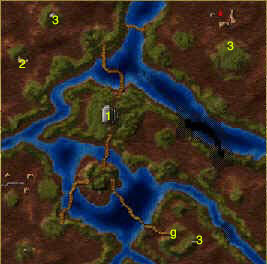 (before going there look for the other quest about the mines that you can get in the Tulerian forest). 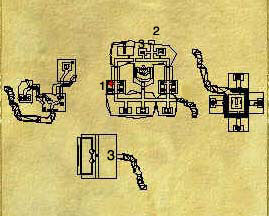 Enter the mines and find the 6 Dwarves on the first floor of the mine.Then return to the king. Inside your castle now every thing is fixed,enter the throne room and meet the ambassadors of the Elf King(Tularean Forest) and from Queen Catrine(Erathia). Meanwhile the Arbiter will be killed. Now you have to chose the new one Return to your castle in Harmodale and meet the ambassadors.If you want to follow the path of light go in Bracara Desert and enter the inn there.Talk to the man inside and take him in the arbiter house in Harmodale(1on the map). If you want to follow the dark path go to the inn in Deyja and take the new arbiter in Harmodale. Now the war is over and the teleport for Celeste will be functional. So go in Celeste and meet the King in Castle Lambert .He will give you the Mist quest. 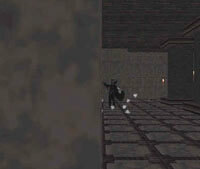 To pass the quest you have to enter the hall of mist from the entrance and exit from the backdoor. First of all you have to find the 3 keys for unlock the backdoor.Use Invisibility .Inside enter one of the 3 teleporter doors. 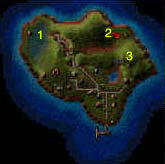 Now in one of the 3 you'll have to press 4 levers near 4 fountains, then the central fountain will be empty and inside you'll find the chest with the key.In one of the other zones that your reach via teleporting you have to press 2 buttons and a lever to unlock a secret room, in the last teleportig zone you have to press some altar then take a lift for an upper zone where the chest hides. When you have all the 3 keys use it on the 3 points in the main room to unlock the backdoor.Now return to the king. 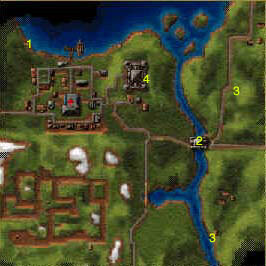 Go out Castle Lambert and look for the 4 houses(4 on the map). 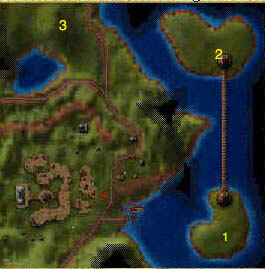 1)Purify the Altar in the temple of the moon In Evermorn isle. 3)Kill the Vampires in the wine cellar in Tatalia. 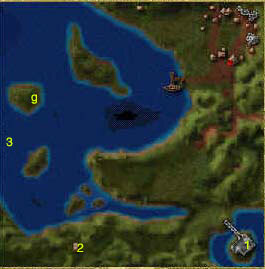 4)Kill Toloberti in The pit (look for 1 in the pit map).Tip: I have readed that using protection from magic will help, but I find after been killed 20 times that the better way is to make toloberti follow you ,the run for the corner on the left near the stairs and hide yourself ,from there you can shoot him using some good magic and he can not . After the 4 Quests go Again in Castle Lamber ,Resurecta will ask you to take a piece from the altar in the temple of Dark in the pit and a piece of the altar in the Temple of light in Celeste. 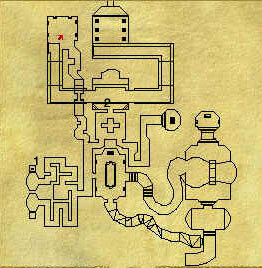 Ok go in the temple of Dark in the Pit , the piece is under the altar. In the temple of light go on the upper level from the altar ,looking to north the right combination is :press moon on the left,stars in the center and sun on the right,go down and click on the altar ,a wall will open, inside you'll find a chest with the missing piece.Return to Resurecta. Now it's time to slay the Xenofex in the Colony zod,in the Land of the Giants. Enter the zod and take the lift up, press all the buttons and go in room 1(look map). Use jump and reach the ledge.Click on the cage and get key. Go down and enter the new tunnel,in the big room kill the Xenofex ,and go Back to Celeste. Retrieve the Oscillation Overthruster from the Lincol. First of all go outside the throne room an get the new suits. 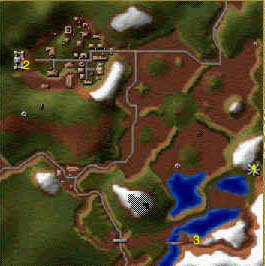 Then go in Alvee and cast water walking the go west pass the isle and you will find a new location. Back to Castle Lamber in Celeste ,final movie. It's time to pay a visit to the Pit. Inside the Pit go to the castle(3) and meet the King. The first quest will be to kill all the monster in the Breading zone and exit. 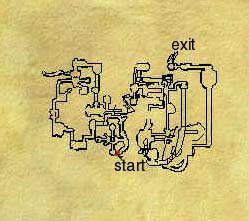 The entrance is near the exit of the Pit,take the stairs down and enter it. Kill all the monsters and then go in the room with a missing bridge(2) and drink from the left fountain.Now the bridge will be lowered,cross it and push button. Exit from the big room in the north section.Return to the king. Second quest=Clear the Clanker's Laboratory and lower the defense shield. The lab is in the Tularean Forest on the north island, enter it and kill all the monster,then in the library(1)look for the moveable book and enter the secret laboratory, click on the machine. 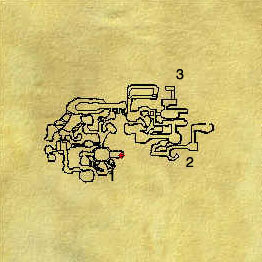 Third quest=Find the piece of the key in the temple of Light (Celeste and the other one in the temple of dark(Pit).It's the same quest of the Light path. In the temple of Dark in the Pit , the piece is under the altar. In the temple of light go on the upper level from the altar ,looking to north the right combination is :press moon on the left,stars in the center and sun on the right,go down and click on the altar ,a wall will open, inside you'll find a chest with the missing piece. Forth quest=kill Robert the wise in Celeste. place yourself near the big room corner and shoot him, he will not be able to shot to you. Return to the pit.Back to Toloberti and then to the Castle. The king will ask you to slay the Xenofex in the Colony zod,in the land of Giants. Enter the Land of Giants via the tunnels. Then enter the zod and take the lift up, press all the buttons and go in room 1(look map). Use jump magic and reach the ledge.Click on the cage and get key. And ready for the last quest. Darron Temper, in the Temper residence, ask you to find The Fate of Elron Temper so go in the White Cliff Caves and go in the north east corner there you'll find an AcroMage Deck, take it back to him. In the church, a man will ask you to find the The Lantern Of Light, that is in Barrows crypt n�2 if I remember. Bartholomew Hume:in a house in the small village north of the castle will initiate Priest and will ask you to find the lost meditation spot in Barrows down. 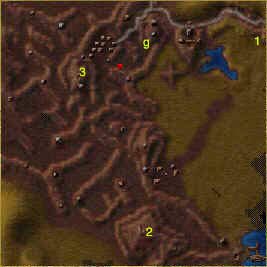 (so go in barrows down enter the barrow10 ,9,or 7 and look for the key that opens the hidden map, now move the lever behind the map for reach the barrow you what in this case try to reach barrow 4 and then the one with an ankt inside click on the altar,now Bartholomew Hume telling you that you have find it. After you Have chosen your path light or dark, you can return to him only if you have chose the light path and he will ask to find the Priest in the Temple of Baa in the north east part of Alvee. In the inn a man will ask to find the The Signet Ring stolen from the bandits, look for it in the bandits cave in Erathia. 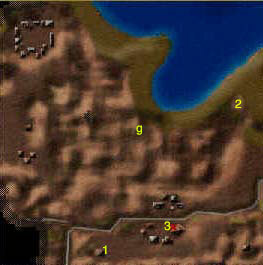 The Barrows crypts(3) : 3 quests will lead here . 1)the first is obtained in Erathia from the man in the house in front of town hall.,for the knight-Cavalier promotion.Kill all the monster inside the house. 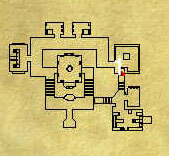 3)lower part Is the master tomb. 1)(during the war)before you choose the new arbiter)The Queen will ask to rescue Loren Steel from the elves in the cave in the Tularean Forest. 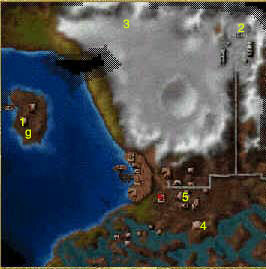 1)Kill Wromthrax the dragon for the crusade quest(located in a cave in tatalia). 2)(path of light must been chosen) Free the woman from the house in Deyja (look for Deyja's map). The letter quest from Norbert Thrush.Take the letter to Lord Markham's in Tatalia. 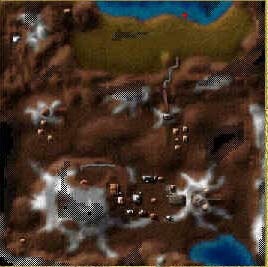 Bracada Desert - Barrow Downs-Tularean Forest-Deyja -Evermorn Isle -Nighon -Stone City -Tatalia -Harmondale -The Pit- Steadwick . 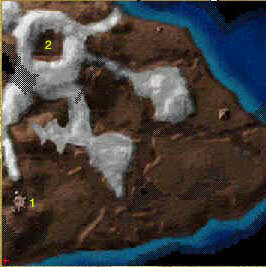 3)the Cave and the chest with the trumbet. 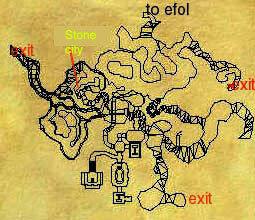 The entrance is in Stone city, then down in the tunnels under the city. Inside the Nighon tunnels go north east for the exit to the thunderfist tunnels.